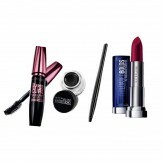 Amazon is Offering Maybelline New York Hypercurl Mascara Waterproof, Black, 9.2ml + Maybelline Lasting Drama Eye Liner Drama Gel Liner, Black + Maybelline New York Color Sensational Loaded Bold Lipstick, Midnight Date, 3.9g Rs. 543 Only which is worth for Rs 214.Delivery Fee: Prime Rs 20 | Non-Prime Rs 49, FREE delivery above Rs 599.You can follow the below steps to buy this product at their deal price.Keep Visiting dealsheaven.in for more Best offers ,hot online deals, promo code, coupons and discount . How to buy Head & Shoulders Smooth and Silky Shampoo, 360ml?